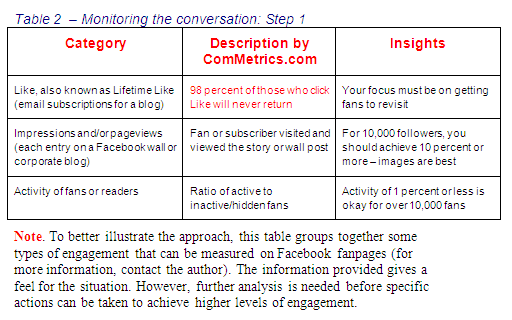 This week’s ComMetrics weekly review also addresses monitoring Facebook impact. What exactly are we monitoring? These days we have a tendency to monitor everything, which leads to getting inundated with useless data. In order to save time and focus on the critical benchmarks, we prepared Table 2, which lists several categories that could be monitored and describes some additional factors to consider. Nevertheless, it is just the first step. As you can see, getting someone to Like a Facebook page is just the beginning, similar to impressions and pageviews. While these indicate that people come back to view or consume the content you offer, data might still reveal that only a small percentage of your fans are active. And using those numbers while comparing apples (e.g., a consumer brand like Starbucks, KitKat, Nespresso – George Clooney) to oranges (e.g., manufacturers that sell to business like ABB, Westinghouse, IBM, Siemens) makes them meaningless. Your mid-size manufacturing firm (business-to-business, B2B) will definitely have different levels of engagement than a chain of 20 stores (business-to-consumer, B2C). 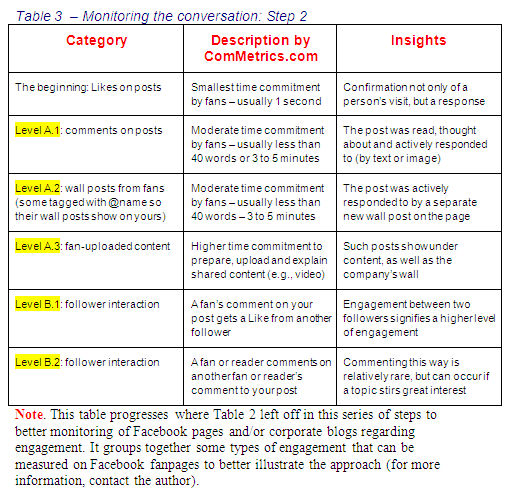 Table 3 focuses on the type of engagement or interaction. Specifically, Level A.1 focuses on comments made on your posts, but people may do more than just leave a comment and write original posts to your wall instead (see Level A.2). Level A.3 includes situations in which individuals upload images or videos about your product(s) to your page to share with other followers. Level B.1 focuses on situations where fans start sharing in response to your posts or product(s) among themselves. For instance, a comment left by a fan or reader elicits a Like or comment from another fan or follower. Comments (Level A.1 in Table 3) per 1000 fans increased from 0.07 percent for each post in Quarter 3 of 2010 to 0.23 percent by Quarter 3 of 2011. This might raise a second, ‘so what’ question before recommendations for action are made, and that is fine. However, if we get more than two or three ‘so what’ responses in succession, we have the wrong metric and should therefore kill it. This indicates that Facebook engagement is a concept that is best used if you develop metrics to help you achieve your objectives. Such tailor-made measurements result in the actions required for bottom line improvements achieved by better engaging fans on Facebook. This is by no means an easy task, but following the steps outlined in Tables 2 and 3 will help you find the most effective solution that best fits your company’s context. By the way, if you want to find more of our posts and white papers on this or any other topic, just enter a keyword and our name on your favorite search engine, such as ComMetrics Facebook engagement metrics. 1. How do you measure engagement on your company’s Facebook page? 2. What are your key indicators for monitoring your Facebook page’s performance? 3. How do you know if more than 1 percent of those who Like something of yours in the last six months have engaged in the last 30 days? Please leave your answers in the comments section, and as always, thanks for being a part of our community! This is a great post.nnThanks for this! Zishaonnthanks for the note, I will have a follow-up to this one coming up tomorrow.nnIncidentally, we all want engagement with Facebook but most strategies people use (such as pushing their product with spam in a blog comment – you know that one) fail miserably.nnSo it takes time, patience and engagement as well as joining the conversation to improve and make more effectivee use of social media. Next post: Measuring Facebook engagement: Did you score?